A new monastery in France! A beautiful building, constructed of durable building materials and roofed with tiles was erected near the city of Caen. The building’s chapel has an adjacent bell tower. Two bells, one named “Gabriel Maria” and the other “Joan of France,” were installed on September 8, 2015. The monastery, located in the middle of a large park, is shaped like a huge bird, with one straight wing and the other slightly curved. Where did the idea come from to build a monastery in Normandy (in the northwest part of France) at the place where a home for elderly priests once stood? There was nothing except that “Fiat!” Like Mary when she uttered “yes,” not knowing where it would lead her, the “yes” spoken by the Annunciade Sisters also took them on an unfamiliar road, towards a new foundation! There were at least two factors that prompted the Annunciade Sisters to undertake the construction of the new monastery. First, the two preexisting monasteries — one in Brucourt in Normandy and the second in Menton in the southeast of France — were too small. Second, the local bishop, Jean-Claude Boulanger (from the Diocese of Bayeux-Lisieux), who was not sure what to do with an empty house in Grentheville that no longer met the requirements for a residential building, made us an unexpected proposal. From the beginning, Mother Ancilla was delighted with this place. She wanted Jesus to be at its center. 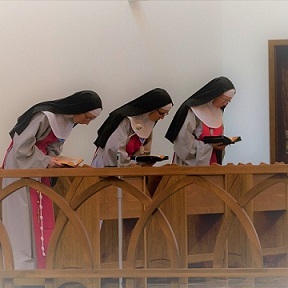 Therefore, she intended to make this monastery a place of Eucharistic adoration that would attract young people and spread the Marian spirituality of the Order. The Sisters decided to build a larger monastery than their current needs require. Why? The truth is they live in hope of an abundance of future vocations. The Grentheville monastery is unique in that it harbors three branches of the Order: contemplative (nine Sisters), apostolic (four Sisters), and the confraternity of lay people. Both the communities of the Annunciade Sisters reside in the same monastery, but separately. The Contemplatives pray in the chapel six times a day. They are joined by the Apostolic Sisters, who come from Belgium. At the request of the bishop, they will organize meetings for people who want to delve into the Word of God. They will also help the Contemplative Sisters in receiving guests (at the designated facilities). On Sunday, February 7, 2016, the inauguration took place. Approximately 250 people gathered in the chapel of the Annunciation of the Blessed Virgin Mary. Bishop Jean-Claude Boulanger and Bishop Michel Santier (from the diocese of Créteil) concelebrated in Holy Mass.